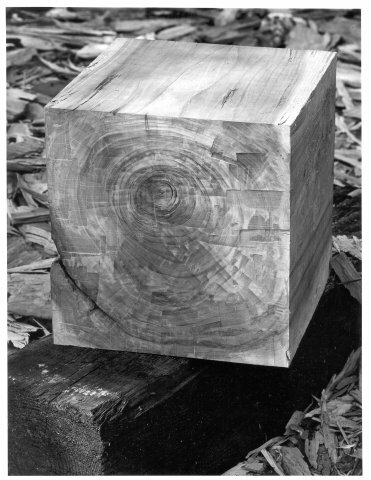 Klaus Steinbrenner works in wood and stone. He sculpts his works out of a solid block but his sculptures always maintain the original block. Originally, Klaus was influenced by his elder brother Hans with whom he worked for a number of years in Frankfurt, Germany. The 1968 move to America liberated him from the constraints of middle class German society. It was in Chicago where he invented new forms with the cube at the center. Based on the cube, he created numerous sculptures in stone, wood and painted plywood. His work was recognized by the Chicago Art Institute and Skidmore Owings and Merrill, the leading architectural firm in Chicago. Companies like Baxter Lab and Quaker Oats bought some of his sculptures for their art collection. In 1983 Klaus and his family sought the tranquility of the countryside and moved to Wisconsin north of Madison. This move was detrimental to Klaus' career as an up and coming sculptor in the Chicago area. Three years later, the family moved again, this time to Framingham, MA where Klaus maintained a studio. But because of lost connections, he could not regain the the recognition that he had established in Chicago years before. In 1993, when his wife career caused the family's move to the Philadelphia area, Klaus shipped all his work and studio to the family's place in southern Ireland. It is there where Klaus works today and where visitors can view his sculptors and applied art works.